Transgression is truly a key idea for our time. Society is created by constraint and boundaries, but as our culture is increasingly subject to uncertainty and flux we find it more and more difficult to determine where those boundaries lie. 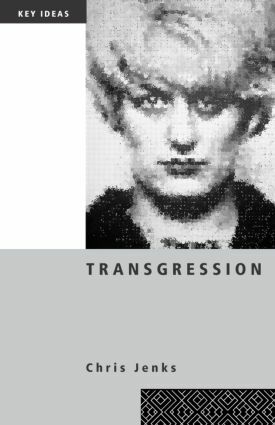 In this fast moving study, Chris Jenks ranges widely over the history of ideas, the major theorists, and the significant moments in the formation of the idea of transgression. He looks at the definition of the social and its boundaries by Durkheim, Douglas and Freud, at the German tradition of Hegel and Nietzsche and the increasing preoccupation with transgression itself in Baudelaire, Bataille and Foucault. The second half of the book looks at transgression in action in the East End myth of the Kray twins, in Artaud's theatre of cruelty, the spectacle of the Situationists and Bakhtin's analysis of carnival. Finally Jenks extends his treatment of transgression to its own extremity. This popular series covers the main concepts, issues, debates and controversies in sociology and the social sciences. The books are concise and informative yet lively. Written by leading authorities in the field, they give students access to 'new sociology' in manageable form.